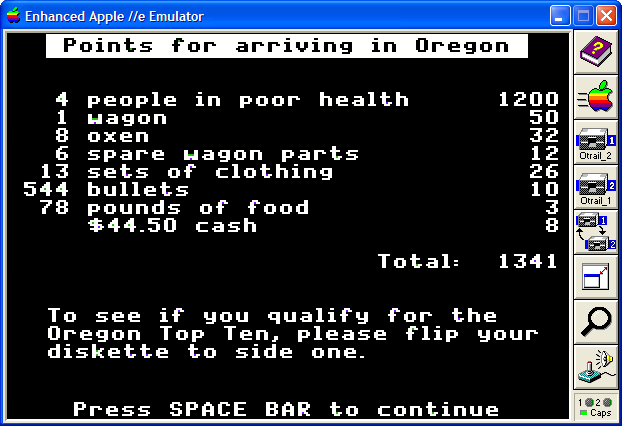 I never played Oregon Trail in school. We played Lemonade Stand and programmed in Logo. Even though Oregon Trail and Lemonade Stand were created by the same company (MECC), I never heard about Oregon Trail while I was in junior high school. I’ve since heard enough about it that I wanted to give it a spin. I don’t know where you can play it online. The one site everyone links to doesn’t work (the Firefox plugin link is invalid.) An alternate version is available, but I wanted to play the original in all its glory. 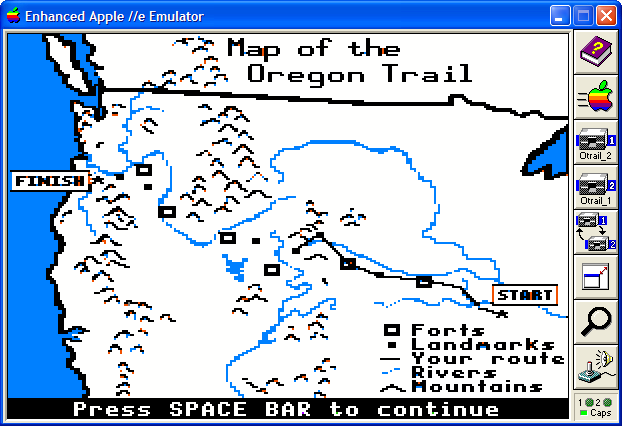 To play it on Windows XP, download the Apple //e Emulator and the Oregon Trail ROM. Unzip the two files and run the emulator, then drag the ROM files onto the running emulator. That’s it. Final score: 1341. I should have read how scores are calculated. I was a banker, but farmers get triple score if they arrive in Oregon. Bankers get no respect. With the emulator you can play dozens of classic Apple IIe games. Download the ROMs from ClassicGaming and drop them into the emulator to play. You never played Oregon Trail in school?! It’s honestly not that great a game, although playing it on modern hardware makes it go MUCH faster. I think the only reason anybody still plays Oregon Trail is because they remember it from their childhood – I know that’s been the inspiration whenever I’ve looked it up. Having now played it, I can safely say there are other things I’d rather do with my time, but it was fun to play it once.